i like to punch my cigar as opposed to cut it. Is there a proper way to ensure you get a good draw? Today I picked my hole as usual and I was having trouble on the draw until about halfway. Is there a good way to fix the draw while you are smoking? I see these poker tools which I've ordered one and I see it arrived at my house but I won't be back home until tomorrow afternoon. Many things can affect the draw. A wet or too humid storage, the construction (the maker rolled it too tight) or a host of other things. One of the first two are most likely what you ran into, as you stated that once you got past a certain point, it got better. That is usually an indication that the cigar is a little wet or was rolled with a "hard spot". In the latter case, not much you can do except try using a poker, but that can sometimes give more problems. Heard that. So when you punch the cigar you are just supposed to punch to make the hole and not go deeper right? I'm thinking it coul be that they are too wet. I haven't got my bovedas yet to place in the tupperdor. They will be in tomorrow. You want to punch thru the cap of the cigar. If you don't go through the cap, then you will not have a good draw. The only thing you need to be concerned about going too deep (so many innuendos on that comment) is cutting bits of leaf that you will draw into your mouth. Personally, I prefer a cutter, because the draw is usually better, but the bits of cut tobacco are even worse to deal with, but you grow accustomed to it. Do you have a good hygrometer? It is pretty much maintenance free. Not yet. My hygrometer will be in Monday I think. I am a total newb. Basically I went to Cuba and got into smoking cigars in the afternoon and I really enjoy it. I've always enjoyed smoking (I used to smoke 2 packs of cigarettes a day). So basically I came home with these cigars without having the correct means of storing them and now just waiting on the supplies. I was never much of a cigar smoker but my eyes have been opened and I like my afternoon cigar while relaxing especially on my days off. At this point I'm trying to make sure I can care for a collection of cigars and plan to start out with samplers to hone my palate in more to figure out what I like. I've spotted a couple of 5-packs I'm going to buy once I have all the means in place to care for them correctly. It sounds like you are starting off well. One thing that you will find with Cuban cigars is that they tend to be on the tight side. It seems to be more common with them, then domestics. But often worth the effort to correct them. I've seen that before. But honestly I never had any draw problems with the cigars I smoked over there. I'm thinking though that the problem right now is that they're too wet because we tend to have a very humid climate here. I'm on the Pathetic NW Oregon coast where the humidity is similar to yours. I run into the same thing. I keep a dry humidor for "dry boxing" cigars for a couple hours prior to smoking them. One thing to note. If you ever smoke cameroon cigars outside, let them sit where ever you plan on smoking them for at least 30 minutes before you light them or they will explode. I love cameroon cigars, but in a wet climate, they need delicate handling. The main problem for me is that I don't have the environment in place yet so it makes it hard to diagnose any problems because Theres no way to tell the exact rh lvls and temperature levels that the cigars are being stored at. I think after about a week or so of having the necessary stuff I will be able to provide myself with a better experience all around. I will say however that the cigars i bought from the farmer are the best ones out of the lot that I smoked while there and brought home. Could be one of a hundred reasons for bad draw. Even the top cigars in the world are going to have some duds. But definitely get you a good hygrometer. If you let the bunch twist up, then it plugs up. Think of wringing a wet rag. If a torcedor screws up this fundamental, that shows he is hurried or lacks the basic skills. I mean, I am just a rank amatcher, but I figured that bit out a while back. When you poke a stick like this, that wet rag twist sends your poker off center, which bursts your wrapper. 2) Too many Cubans are rolled absurdly tight. Perhaps they are laughing at the tourist. Or perhaps their binder & wrapper is too stretchy & damp, so that as the cigar dries out it tightens up. I dunno. My feeling is, when it's that tight, toss it. 3) Either way, if you poke the thing you will tend to taste primarily ligero center, which defeats the blender's art. One thing that I did not realize at first, even the the humidity level is super high outside, if your A/C is running you can bet the humidity level inside is super low. One thing people forget about punching a cigar is tar build up. I used a punch for a couple of days but ended up ditching and returning to a cutter. The main reason being that I like to make 2-3 cuts over the course of a cigar (a sharp cutter is a must). The refresher cuts allow me to "start over" with regard to tar build up and also saliva (particularly if drinking a salivation inducing beverage). This makes for a much nicer/cleaner overall experience. Just need to be mindful of your cutting to facilitate the cuts and not remove the whole cap. Sometimes (on very large cigars) I may even make 4 cuts overall; there is plenty of room if you are precise and most cigars are double or triple capped. As far as conditions go, cigars that are well rested and acclimated (30 days plus) will smoke the best IME. Huge swings from storage conditions to smoking conditions will also contribute to problems but tend to lean more in the humidity issue direction but some (desert dwellers) may have problems with dry conditions. 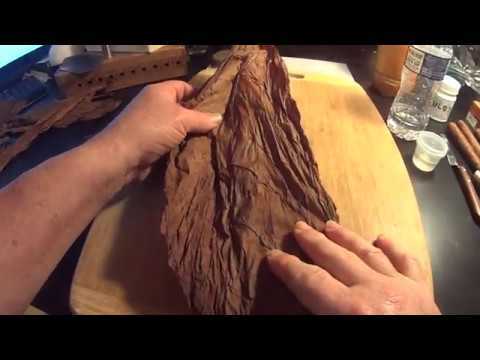 If you are getting tar build up using a cutter, how fast are you smoking the cigar? The only time I ever get tar build up is when I smoke too fast. If I take my time and smoke at my normal pace, I never have any problem with it. But personally, I don't care for a punch, cause I like a smooth draw and if I use a punch, I end up making 3 or 4 punches to get it where I like it. So, cutter works best for me. I don't get the drippy waxy tar build up often, it is quite rare in fact; I do however, get some slight build up of light tar that mixes with saliva and I do not enjoy a cigar that is wet. I know some folks don't mind and will puff a cigar till the end that is wet, heck some even dang near chew on them but I digress. I like my cigar to remain relatively dry as I think it smokes better and provides better flavor being open and free vs. wet clogged/compressed. I also (at the risk of "that's what she said jokes") don't like the way wet slobbery cigars feel in my mouth. It sounds a bit brown-eye-retentive (and may be a bit ) but I like what I like. Needless to say, I only do this with a private cutter that is not passed around/shared. It dose get the cutter a bit messy but I found a bunch of cheap/sharp cutters that I use specifically for during smoking cuts. I generally only do a 2nd cut 90% of the time (about halfway through) so it's not a excessive thing. I only do a 3-4 cut if I'm salivating excessively. I have tarted up bad on a few perfectos or belicosas that I can too shallow. Easy fix, but terrible taste. Same here. I have only noticed tar buildup with too small a cut with a tappered end or a v cut on a rounded.